Party party. | An alien voice under a duvet of dreams. Posted by phoenixaeon in Birthday, The Principessa Files. Where are all the guests? Yesterday, it was Princi’s seventh birthday. She had been excited since Monday as she knew she would be having a party – although the threat of having her birthday cancelled due to bad behaviour marred her excitement for about five minutes. 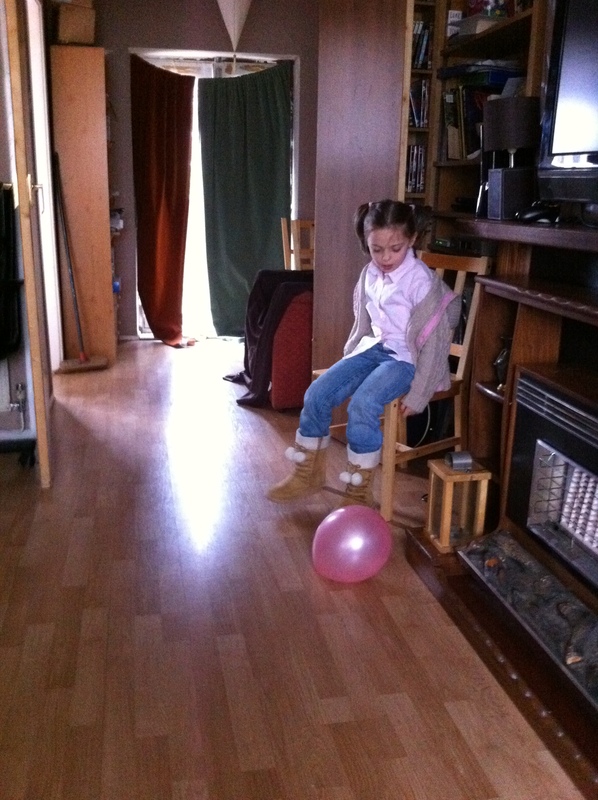 Still, she bounced around in anticipation… Up until the half hour preceding the party. She sat on the chair, thoroughly dejected. Uncle Gareth tried to distract her with a bowl of chocolate coins, telling her that when a guest arrived she should go to the door and say, ‘Welcome to my party, would you like a chocolate coin?’ That cheered her up for a few moments, but when no-one knocked at the door, the sad face came back. Finally, a knock came. Princi grabbed her bowl of chocolate coins and tackled Uncle Gareth to the door, desperate to get her welcoming speech out. And then that was it; a happy Princi, friends, and balloon fights! Once the balloon battle was over, we all played sneak attack for cupcakes. I covered my eyes and the kids crept towards me, stopping and standing like statues if I uncovered my eyes. 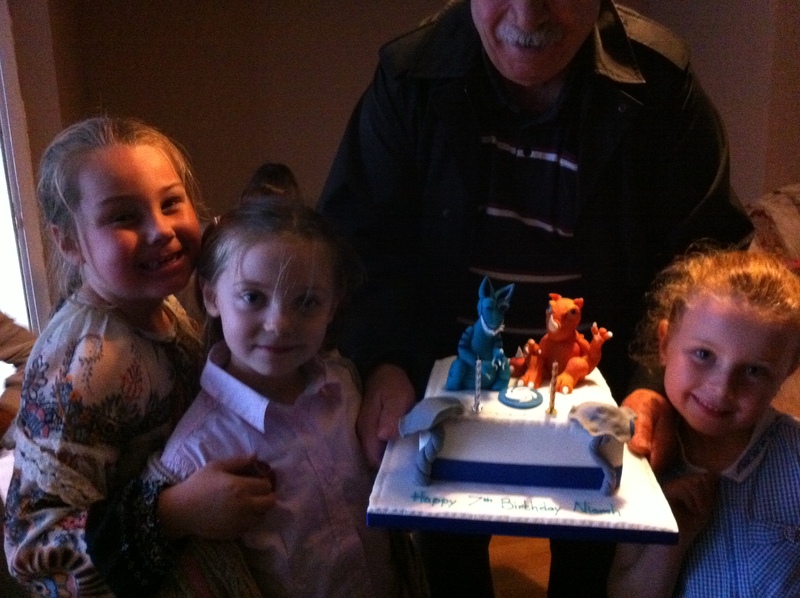 To say it felt like I had been ganged up on by a bunch of mini Weeping Angels would be an understatement! It was scary how quiet some of them were! After a few more games, the food was unwrapped and descended upon. I had put some fruit on the table – pineapple fingers, apple slices, and grapes – fully expecting the kids not to touch it, overlooking the healthy stuff for the likes of crisps and jelly, but no. I was the fool. Nearly all the fruit was gone after the first visit to the table. 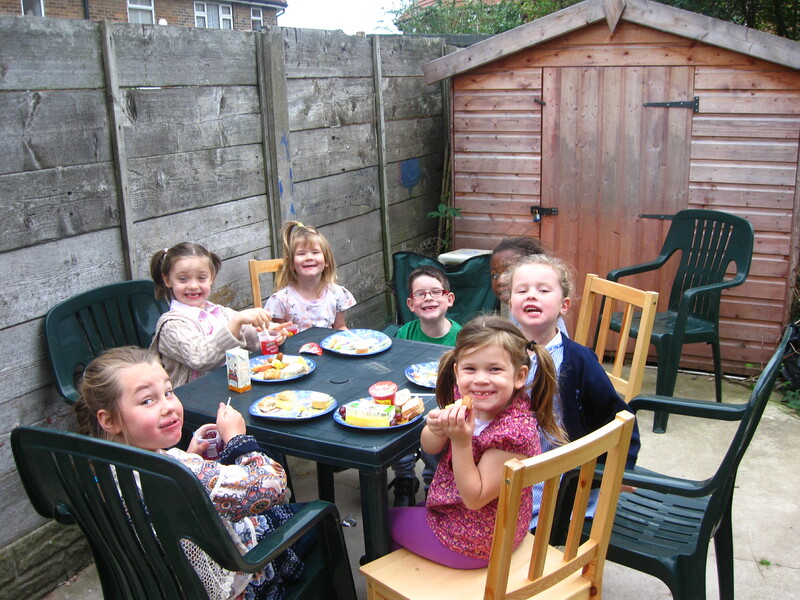 Then the second surprise – the kids then took themselves off into the garden to sit at the patio table. Uncle Gareth acted as a Pied Piper figure, the kids followed him about because he was being as loud and silly as they were. I have no clue what he was doing while they were eating their food, but there were loud screams and raucous laughter coming from the garden, so I can only imagine he was doing disgusting things like spitting out jelly or sucking jelly up through his nose! 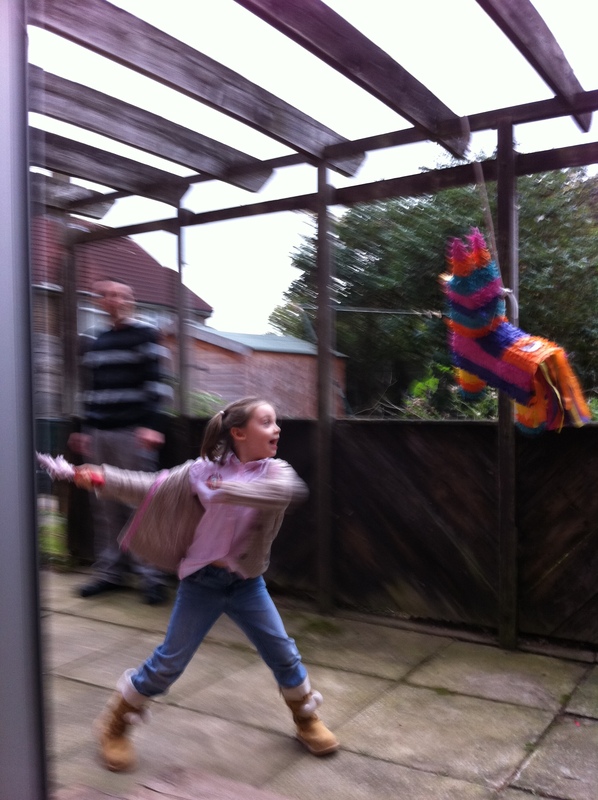 Uncle Gareth also supervised the craziness that ensued when the piñata was unveiled. Oi! Donkey! Gimmie my sweets! Thankfully, there was only one slight bonk on the head when one of the girls, L, hefted the stick above her head and knocked the little boy, C, gently on the head. But wow! The kids were brutal with that wooden cosh! Then it was time for the cake. This was the bit I’d been looking forward to, simply because Princi didn’t know she was getting a special cake. 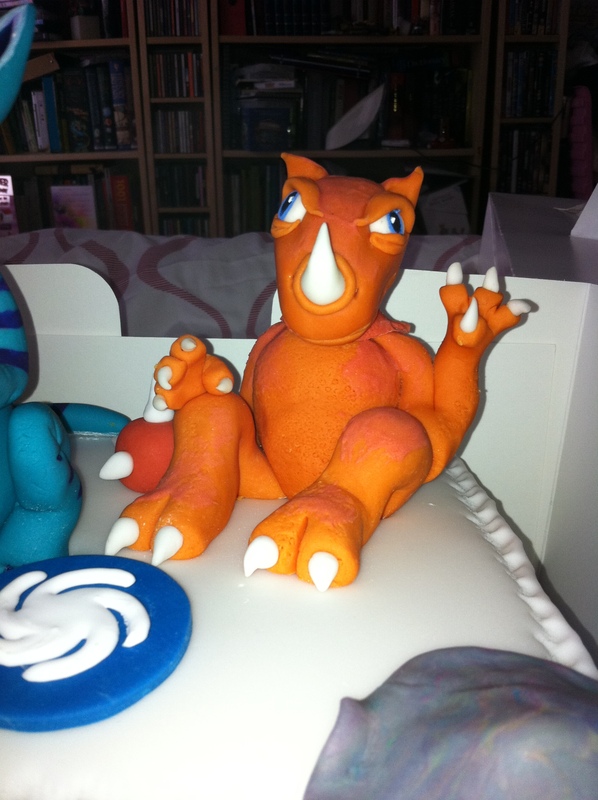 She is addicted to a game called Spore Hero Arena on the ‘Intendo DS, so it was my intendo to get a cake made with some of the Spore Creatures sat on top. 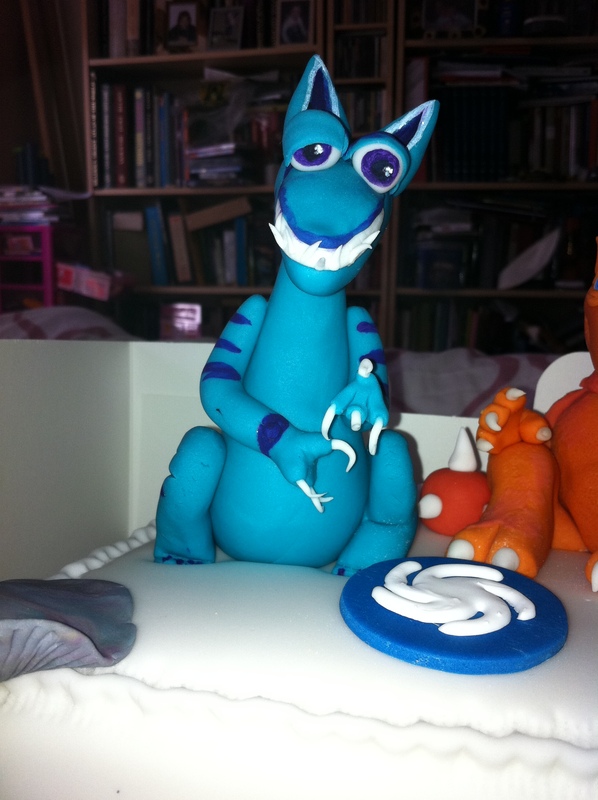 There were gasps of ‘Wow’ when the cake came out, and Princi was suitably stunned by it too. Parties, parties. Maybe I’m just getting more used to them (for kids), they seem to get easier. The last one was a camp sleep over for the whole class (ten year old birthday). Much less stressful than pregnancy (birth was ok) and all my experiences of “professionally managed kids parties” (I think I may have just been unlucky though, someone must be able to do them well?) and so much easier than the parties that required parents to stay too because really the children were too young to be independent. I love your opening, the anticipation, the waiting – I hate that bit whether its a party I’m hosting or one my child is. Personally I go a quick alcohol remedy but chocolate coins, perhaps I should give them a try. No, the party wasn’t stressful, the party was great! It was the preparation. Only because I stupidly started planning a week beforehand. There was no possibility of having the party at home, so when it suddenly clicked to ask my brother if we could have the party at his, it gave me only days to organise. And having never thrown a kid’s party before, I panicked a bit. Only one parent came and stayed, no alcohol was consumed, and we all had a good time in the end. I will plan ahead next time. That way there shouldn’t be any stress. Oh, and pregnancy wasn’t too stressful, but the thought of possibly needing a ceasarian scared the crap out of me. So that and the fear of the big needle that they jabbed me with when they gave me the epidural (which I didn’t want) caused all the stress during childbirth. Gosh, that looks impressive! Little elf will be have her first party (she’ll be four) in December and we’re expecting similar levels of hysteria! I wish you luck, then. That was possibly more stressful than giving birth!